Indianapolis, Indiana: The Eiteljorg Museum of American Indians and Western Art is proud to announce the gift of the Helen Cox Kersting Collection of Southwestern Cultural Arts, a multi-million-dollar collection of nearly 800 objects, including the best of Southwestern pottery, jewelry and other objects. The collection will be the basis of a forthcoming book and an exhibition in 2010. Helen Kersting is a native of Belleville, Illinois and a graduate of the Millikin University School of Music (Decatur, Illinois) and attended the Juilliard School of Music (New York City) debuting with the New York Philharmonic Orchestra conducted by Leonard Bernstein. A mezzo soprano, she went to the Cologne, Germany Opera on a four-year contract, met and married Dr. Hans Joachim Kersting and resided in Cologne until her husband’s death in 1999. The Kersting jewelry collection of over 300 items includes belts, boxes, rings, bracelets, necklaces, pins, earrings, bolo ties, hair pins and cufflinks. There are pieces older than the use of artist signatures or hallmarks whose origins are still being researched. Zuni examples by master artists Leo Poblano, Leekya, John Gordon Leak and Dan Simplicio are notable. Many of these examples came originally from the historical collection of trader C. G. Wallace. Among the great jewelers represented in the collection are Charles Loloma, Carl Clark, Vernon Haskie, Denise Wallace, and many others. Elegant silver and turquoise examples abound and there are many high art pieces in silver and gold with opal, coral, diamonds, and other materials. Kersting has been very focused in the creation of her pottery collection of nearly 400 items. A number of prehistoric coiled jars came from her parent's acquisitions of the 1920s and 1930s, along with quite a few baskets. Historic period San Ildefonso, Santa Clara, Zuni, Zia, Santo Domingo, Cochiti and Maricopa pieces ad significantly to the Eiteljorg collection. 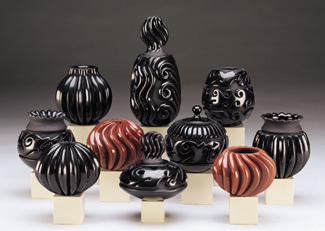 While the Eiteljorg has a few pots by Maria Martinez of San Ildefonso, the Kersting collection includes an expansive grouping of Maria's work in different forms and colors, several with her potter son Popovi Da. The acquisition of the Kersting collection represents a watershed moment as the Eiteljorg Museum celebrates its 20th anniversary in 2009 and looks toward the future.